Erleben Sie die Big Island von Hawaii aus einer einzigartigen Perspektive! Hale KarmaSu ist Teil KarmaSu Coffee Estate Farm, ein 9-Morgen-Kaffee Obstgarten befindet sich auf der sanften Abhang des Berges Hualalai, in Kailua-Kona. Das Anwesen ist seclude und privat, perfekter Rückzugsort mit allen modernen Annehmlichkeiten für einen Familienurlaub. Nur 20 Minuten von Kona Flughafen, Costco, Lebensmittelgeschäfte, atemberaubende Resort Strände und schönen Kailua Bay, dem Ort des weltberühmten Kona IronMan. Der Hof verfügt über reichlich Avocados, Zitrusfrüchte, Ananas, Litschi, Rambutan, Bananen, Papaya und natürlich mehr als 2.400 Kaffeebäume. Das Anwesen ist ideal gelegen an der kühlen Höhe von 1.600 Metern über dem Meeresspiegel, wo Klimaanlage nicht notwendig, kühle Bergluft in der Nacht ist und luftigen Ozeanwind im Laufe des Tages. Der offene Wohnkonzept Haus verfügt über Hawaii-Plantage Stil mit geräumigen lanais und breiter Überhang Passatwind zu erfassen und regen Schutz bieten, fachmännisch detaillierte Konstruktion im gesamten Gebäude. Alle Zimmer sind angelegt Vorteil der erstaunlichen Ansichten und tropische Brise zu nehmen. Die Küche ist gut ausgestattet, um alle den Wunsch Ihr Chef zu handhaben, zu bereiten Mahlzeiten nach einem Tag der Insel Erkundungen. Obere Lanai ist ein beliebter Ort für Frühstück am Morgen mit Ihrem eigenen Tasse frisch gerösteten Kaffee KarmaSu. Separater Wohnbereich auf der unteren Ebene mit abgeschirmten Veranda sind für Mehrfamiliengebrauch, Meditation oder Yoga entwickelt. Für unsere Gäste Vergnügen, nehmen wir sehr sorgfältig die Landschaft von üppigen Rasen, exotische Blumen und essbare tropische Früchte zu erhalten. Hale KarmaSu ist der ideale Ort um sich zu entspannen und genießen Sie alles, was die Big Island zu bieten hat. Wir sind sehr glücklich, diesen wunderbaren Ort zu Hause anrufen und hoffen, dass unser kleines Stück Paradies für Ihren unvergesslichen Urlaub auf Hawaii zu teilen. Amazing place on the Big Island! Karmasu was absolutely the perfect base for our vacation on the Big Island. 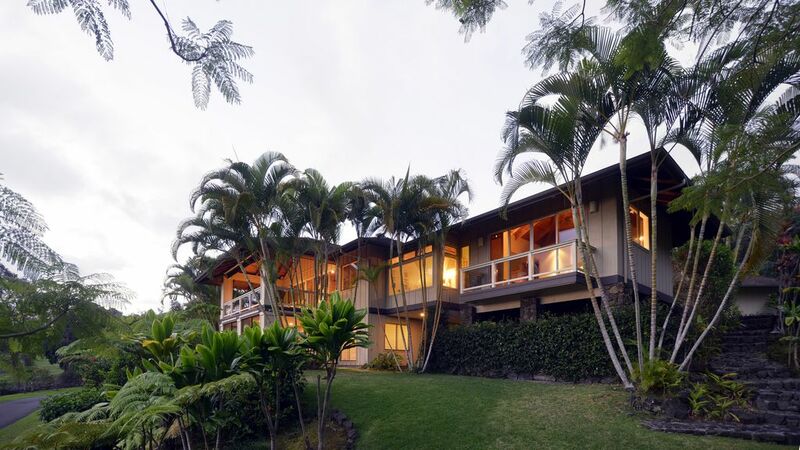 It is nicely located at a higher elevation in Kona for cool breezes and a spectacular view, and very private and quiet. It is centrally located for day trips to the beach, Volcano National Park, Kona town, the Saddle Rd. and Hilo. The house itself is quite spacious, beautifully appointed, comfortable for our adult family of 5. The master suite is spectacular. The crown gem is the kitchen!! Best equipped one we have encountered in any rental, with luxury appliances and a stocked pantry. With fruit and avocado trees on the premises, and Costco < 10 minutes away, and we were in cooking heaven! Thanks Su and Gail!!! Wow...what a comfortable house and we didn't want for anything. No joke, everything we could need/want was covered with the fully equipped kitchen (including pantry items), spices/oils/condiments....all the things you don't want to buy when your on vacation because you won't use them all. We found mustard, butter, olive oil, syrup...so very much appreciated that these were available to use. We arrived on Christmas night and everything was closed, we were thrilled to find Cup of Noodles in the pantry which was our Xmas Dinner and we were glad for it! We so appreciated that towels, chairs, umbrellas etc were also covered. While we didn't watch too much TV, it was sure nice to have Apple TV and other sources to watch movies and shows. The veranda is absolutely picture perfect for sunset and every other opportunity we took to sit, eat, play outside throughout our stay. The house provided more then enough room for the 4 of us - everyone had their own room and area to spend time together or alone. Quiet location, nice to hear nothing but the birds (and the horse next door!) in the morning. Felt very safe with the gates and the security on the doors. While we didn't utilize Gayle (because we didn't need to!) she did check in with us halfway through our stay to make sure all was good. Very much appreciate that. Location is about 10 minute drive from the Industrial downtown - convenient to grocery stores and enough restaurants. Beaches are a longer drive - but this is the big island so prepare for a lot of driving. But everything is absolutely worth it! Thank you for a great stay! Beautiful 9 acre coffee estate in the heart of Kailua Kona with an unobstructive view of the ocean! Our family of 5 absolutely loved our stay at Karma Su! The house was spacious and bright and the kitchen was perfect for all to be involved in the cooking! We fell in love with the coffee as well, just wish we had an endless supply! Perfect place to stay in Kona. Beautiful coffee plantation overlooking the island! Su was absolutely the best host we have ever experienced! He made sure our stay was comfortable and was always able to reach easily with questions. The house was very roomy with plenty of space for my family. Every morning we would wake up and watch the sunrise from the lanai with a cup of Konasu coffee that came straight from the plantation we were overlooking. The kitchen was large with everything you needed to cook your whole stay if you wanted to- spices, oils, pots and a large range. The houses in Kona don't have AC and at Su's house there is no need for it! We had all the windows wide open during the day and it was always comfortable. Up the mountain it's cool at night and felt perfect with the windows closed. We could not have found a more perfect place to stay and highly recommend it if you are looking to visit the big island! We had a wonderful time at the KarmaSu house. The house and surrounding grounds were beautiful and wonderfully equipped. Look forward to returning in the future. Our family of 12 spent 10 days at this property in July 2016. It is quiet, secluded, and very well taken care of. There are many helpful stock items like laundry soap, shower soap and shampoo,spices, lotions, bug spray etc provided which was greated appreciated. We had the unexpected bonus of having Kona raised coffee beans provided during our stay and it was delicious. This was a wet year for Kona and consequently we had mosquitos in the higher elevation, but we survived and were glad that the temperatures were cooler than the lowlands by the beach. It would have been ideal to have two bathrooms downstairs as that is where two of the bedrooms + the kids romper room was located so there was less bathroom space on the lower floor and that was a little uncomfortable for our crew. The upstairs 2 master suite bedrooms were very spacious, private, and luxurious. It is remote in the feel of the location but very close to the city and the beach, we loved our stay. The owners were very easy to deal with and their on site property manage Gayle, was a God-send, she was quick, efficient, and had solutions and information to all our questions. She brought over smoked Marlin one night and we all loved that for an appetizer. Great stay.